While it’s possible to manage your assets and grow your wealth yourself, many people seek the advice of a professional. As you seek out a financial advisor, you might encounter many certifications and acronyms describing both advisors and their firms. A registered investment advisor (RIA) firm is one option you may consider. Understanding what an RIA firm is and how they help their clients can help you decide whether it’s the right path for you. What Is an RIA Firm? If you’re researching an RIA firm, you can find this information on the website of the SEC or state security administrator with which it’s registered. This allows would-be clients to find essential info and compare firms at a glance. What Exactly Does an RIA Firm Do? “RIAs are investment advisory firms which provide financial planning, investment advisory and wealth management services for clients in a fiduciary capacity,” says Riley Adams, a certified public accountant and founder of personal finance site Young and the Invested. RIAs often work with high-net-worth clients and institutional investors to manage their assets. That may involve making trades in or out of a portfolio on a client’s behalf or offering advice and guidance on various investment strategies. The key difference between an RIA and other types of investment advisors is that RIAs are bound to act in a fiduciary role at all times. 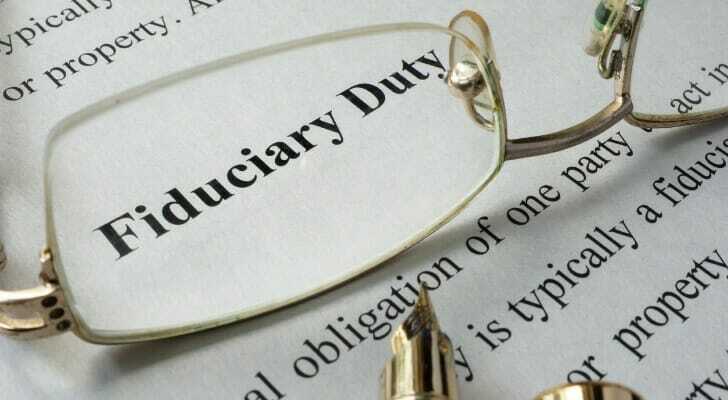 In a nutshell, adhering to a fiduciary standard indicates an RIA is required to act in the best interest of their clients at all times. That means providing investment advice based on what’s best for the client, not what may be most profitable or beneficial for the advisor. The SEC may bring enforcement action against an RIA that breaches its fiduciary duty. RIAs are required to make sure the investment advice they’re offering is as accurate as possible, based on the information they have available to evaluate investments. As fiduciaries, they have a responsibility to keep efficiency and cost in sight when executing trades on behalf of clients. Furthermore, RIAs have an obligation to disclose any potential conflicts of interest as they arise. A fiduciary advisor with a fee-based or commission-based fee structure may still recommend securities for which they receive a sales commission or other compensation. However, the financial product must be in the client’s best interest, and they must disclose that conflict of interest. The biggest mark in favor of using an RIA firm is the fiduciary standard to which they’re held. Another advantage is cost transparency. RIAs may charge a flat fee or an hourly rate for their services. With a flat fee structure, the fee is usually assessed as a percentage of your assets under management. Because a firm must register with the SEC to become an RIA, these costs will always be transparent to you. This helps to take some of the guesswork out of the sometimes intimidating world of investing. An RIA can offer personalized advice based on your investment objectives, risk tolerance, age and life stage. They can pinpoint strategies or investments that may be best suited to reaching your goals and help guide you through major life changes or periods of market volatility. Because RIAs are fiduciaries, they can generally be considered more objective in their approach. When considering an RIA or any other type of financial advisor, pay close attention to their Form ADV. This is the document they must file with the SEC that includes information on cost, past disclosures and potential conflicts of interest. Aside from contacting the firm directly, this is the best way to learn about them. If you need help finding a fiduciary advisor to work with, use the SmartAsset financial advisor matching tool. The free tool will consider your financial situation and objectives to match you with advisors in your area who can meet your needs. The post What Is an RIA Firm and What Do They Do? appeared first on SmartAsset Blog.